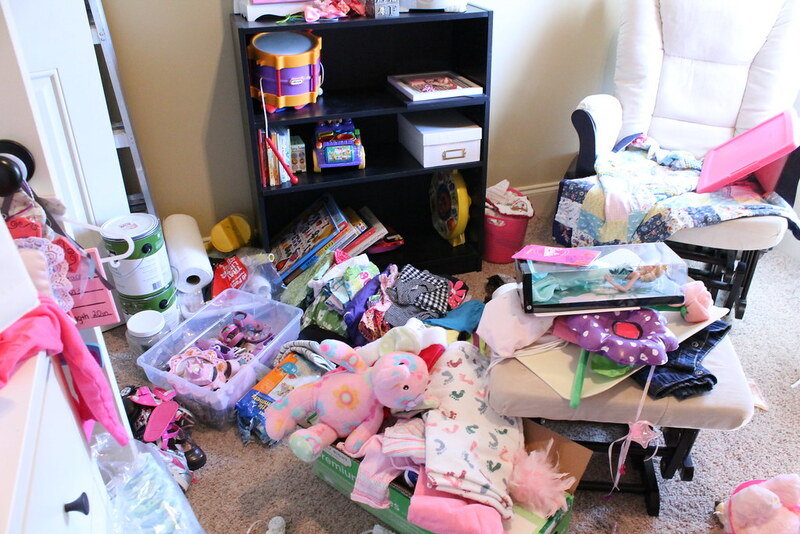 I feel like I've spent the last year organizing a baby closet (and I have!). This time last year I was getting her room and closet ready for her arrival never thinking we'd be moving a few short months later. I love organizing and purging! Really I do. But am I EVER ready to feel settled and to feel like I know where things are. If I can't see them, they are going to be forgotten and outgrown in no time! Here's a peek back to her closet in our old house. It was pretty much the same size but the rod was hung higher to allow for premium storage underneath. I had a TON of clothes up top that were too large that I stored in those clear/pink bins. Overall it worked. Nothing amazing. Slightly reminiscent huh? I mean who keeps paint supplies in their nursery closet? This girl. We have been graciously given hand me downs that took over for a while. I am so thankful to have such sweet friends who have helped dress our baby! In true organizing fashion, EVERYTHING came out. And yes it got WAY worse before it got better. We had gobs of hand me downs, shoes and out grown clothes stashed in the bottom of the closet. I am in the middle of painting her room so the paint supplies really do need to stay for now. Do you know how hard it is to paint with a baby? It seems like she is always in there sleeping or she's awake (duh). I just need to get in there when hubs is home and get things painted. I sorted through it all keeping big clothes and current clothes, purging out grown clothes (a pile for things to return to the owner, a pile for consignment, a pile for donate, etc) and trying to find a home for everything else. Can we say ahhhh as we breathe a sigh of happy organization?! I still have my dividers in there separating the sizes. Smaller clothes are on the right, larger on the left. 9 months to 18 months are hanging currently. We have a TON of hand me downs for 18 month summer clothes and they are PERFECT since she is so big. Also to the left there is plenty of room for diaper storage (even though we cloth diaper we use disposables at night- and whenever her cloth are dirty or being washed). I still have 2 clear bins next to the white ones that hold the clothes she will wear next (up to 2T) and the next round of shoes. Can't even believe my baby will be walking before I know it! I love how well her cheapo $1 hampers are holding up! 1 is for dirty clothes, the other for her cloth diapers. I used the same Ikea containers as I did in Luke's old and new closet in the top of her closet. I can't remember their name but they come in a 3 pack for $15. I actually was going to return them, but I couldn't find any other bins or baskets that were as tall as these for a better price. So I kept them! And I made them lovely with some polkas from my Silhouette. I was going to do pink, but didn't have any pink vinyl on hand so the gray picks up the gray accent wall (that will be there soon) and the curtains nicely. The far left bin holds specialty diapers (pull-ups and swim diapers for later), the middle bin holds large shoes and clothes, and the bin on the right is EMPTY! I had totally forgotten that she has shoes she can wear NOW! This little shelf is in the left corner of the closet and holds little pretties and of course the clothes pin jar (I use clothes pins to keep clothes together- bloomers, shirts, shorts, etc). I will be painting her closet pink shortly, but at least this is done for now! I also need to add a bin at the bottom for outgrown clothes. It's nice to be able to bring those downstairs to sort when they are all together!